What a difference a week can make! April showers do seem to bring May flowers as the saying goes. 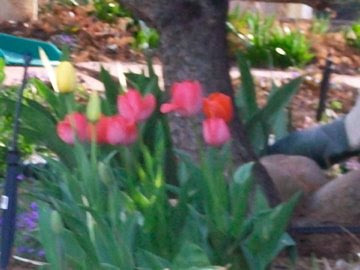 The front garden is blooming. I had a lady today stop me to tell me how beautiful my garden was. oh how I love to hear that.. This week thus far has proved to be very busy. How did I manage to raise 3 kids and get all the extra "stuff" done. Mr.P and myself would have a large garden, chickens , I made the girls 80% of their dresses, knitted sweaters, made almost 100% of my sons clothes. He hated store bought pants.."they aren't soft". I also worked 4 days a week. I must be becoming a wimp!!! Today after work I planted some more peas,and lettuce, watered everything in the garden so far. A few more weeks and the garden will be totally planted. This year will be interesting since we are leaving for China in August, just when the garden will be ready to harvest. oh well that is life, we will be having a family staying at the house when we are gone so they should get some good treats out of the garden. And heck it is just beautiful to look at from the porch. 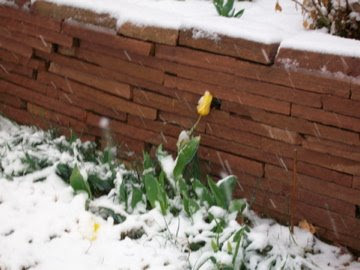 The tulip is a picture taken last weekend for our weekly snow storm we have been getting, hard to complain since we need the moisture. Am still trying to figure out posting pictures, sorry for the confusion. I am not sure how I did this but I believe I am making progress. What I do not understand is why I cannot do this from iphoto. 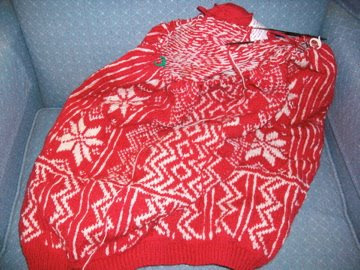 Yes I started this sweater 15 years ago, just found it again and off I go knitting. I had forgotten how fun it is to knit these sweaters. The counting and as the rows emerge so does the pattern, One simple knit stitch can make a beautiful sweater such as this, how cool. Now the big question is, will it fit when done? Good thing I have two girls that are alot thinner than me, if it turns out to be too small on my frame. It is Bread Making Day..... 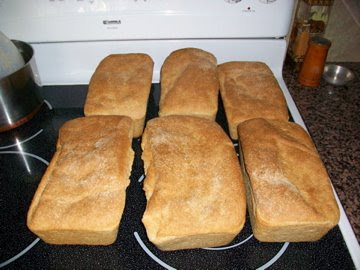 I love to make bread, for me it is empowering. 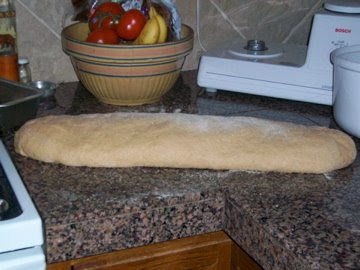 When I grind the flour and make the "sponge" I feel alive!! Is it because bread is a living food, bread is a food everyone has eaten in some form, sometime in their life. 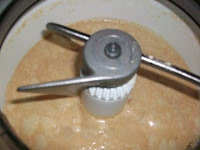 As you make the sponge you can see it coming alive, bubbling up, the smell of the yeast coming alive after having been frozen dormant in the freezer. 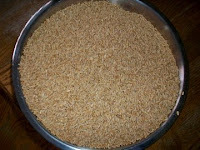 Just mix together yeast and freshly ground whole wheat with some warm water and watch the magic happen. It takes about 15 minutes for a good hearty sponge to form, first it looks like a huge mistake then you see the miracle happening. 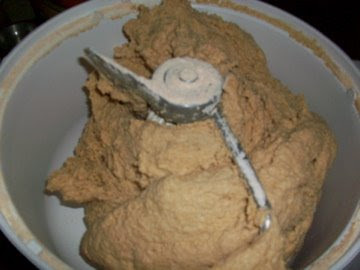 After the sponge forms , start adding freshly ground flour, still warm from the grinding process. As you add the flour the sponge encircles the loose grain and pulls and mixes in, eventually forming a smooth light brown ball that is slightly sticky and elastic. Put your bread in pans let rise in a warm oven then the moment I love the most.... the first cut of fresh hot bread. If your bread is worth anything you will not even need butter. However if you have real butter put in on and enjoy!!!!! 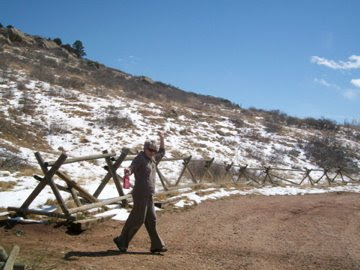 This is my sister Mary Margaret walking down the side of a steep muddy hill. She is holding up her pants which are really Ellen's pants who is allot taller than Mary. She went up the hill holding up her pants and she returned down the hill holding up her pants. 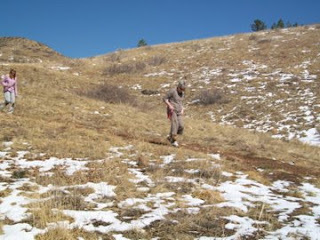 The top picture is MM finishing the trek. We were all so proud of our selves and yes we were sucking air. As you can see I still have not figured out how to move pictures around my post. This is so frustrating. Ellen said she will ask her boyfriend, he is a computer wizard.Yeah!!! Sunday,Sunday the day of rest and get ready for the next week. Our taxes are done and ready to file, another year out of the way, yeah. yesterday I finished quilting a quilt I believe will go to Nora. I am very happy with the stitching , both sides look great! Now all I need is Practice practice to get my drawing and designs smoother. 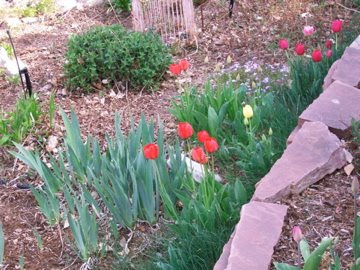 Again today is windy and cold, winter continues to hold a tight grip on Colorado The flowers are in my front yard and were photographed on Wednesday, the back porch shots were taken on Saturday. The only thing one can say about the weather in Colorado is wait an hour or day and it will change. This afternoon hope to have coffee with Kathleen , talk and knit for a couple of hours. Also need to get to the store for next week lunches. Well guess what, it is snowing again in Colorado. Spring is most certainly here with storms that seem to be coming in every third day or so. The grass will be so green by the end of April. Since it is snowing today Mr.P and myself will stay busy in the house. Mr.P has the household bills to pay and the dreaded taxes that are due next week. He hates tax time and I can hardly blame him since I have no idea how to do taxes. Myself, I will work on my machine quilting. I have about half of a quilt done and am loving it. Last week end we "the sisters" went on a hike , more like a mud walk. It was fun and we all felt that we had accomplished a major feat. the boots in the back of the car had put on at 4lbs. each boot. not only did we get some exercise but we all came home with rosy checks and noses. Sun and snow in Colorado. I started knitting a really cute CHICKEN from Blue Sky. I love how it is turning out, but everyone I show it to says" why are you knitting a chicken"? I say why not, she will look so cute on top of the frig. I may even knit her a companion!! I wish I could figure out how to move these pictures around, like in the middle in-between paragraphs. Caitlin if you have any advice please email it to me. Anyone any advice. So little snow all winter, a matter of fact the temps. in February/March were anywhere between 50-70's. Now that we are in April what but snow is coming in every three days or so. I love cold weather over hot, but this is getting kinda crazy. I know North Dakota sure wishes summer would roll around. Blizzards in April? I finished the double diamond quilt mystery by Bonnie Hunter. This was a wonderful quilt to make, a bit challenging and lots of sewing. I just love to run fabric through my machine. I think the borders will be in the background colors, of course scrappy look. 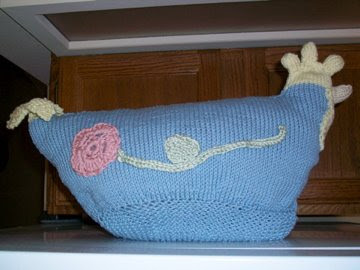 Besides quilting, I started knitting a "chicken" using Brown Sheep blue cotton yarn. Will post a picture when finished. Love the color and texture, stay tuned.